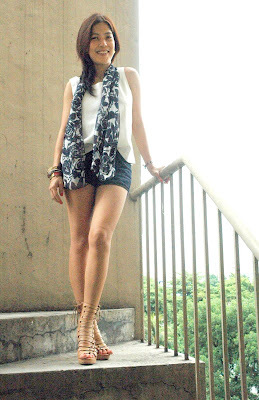 Okies, the outfit...old camisole from grandma's closet, forever21 shorts, navy and white printed scarf from greenhills, parisian sandals and a bunch of bracelets which aren't visible in the photos. Good luck to u Ms. Eggplant! Try to enjoy summer, im missing it so much here in the South Hemisphere! Great outfit! I love that scarf! Thanks for stopping by my blog! I love this look the scarf if chic! Very cute! I love love love those shoes!! good luck with the credit crunch and love your shoes! i so agree with you. it's so effin' hot and dress like gaga and not wear any pants in public. haha! i'll be staying in makati and i have no idea if malapit lang ang araneta. You look great! You have a great figure and look good in almost everything!! I'm so jealous! wow, I wish we had a bit of your heat over in rainy seattle, washington USA! these shoes are AMAZING, love your look! I really like your shoes! Omgosh your shoes are so cute!! I really want to add some strappy wedge shoes like yours to my wardrobe but I can never find ones as cute as yours! Hi Sarah! You look super cute as always. Very summer ready. Yeah, the weather's unforgiving. Even dressing up to go out breaks me into a sweat. Ugh, I got sick on vacation and yeah, I need to let go of salt and eat those vegetables! So sad. Oh by the way, I am staying away from the malls too! My bank account has been wiped out from the recent holiday as well! super hot! i'm loving this summery outfit. lovely scarf and hot legs missy! my bf is filipino and he told me about how hot the summers get:( hope you stay cool over there!! you look hotter than the weather ^__^ you really look good. I can relate to the horrendous heat it gets so hot here in Fl. All I want to do is wear the lightest fabrics that I can find that breathe really well. On another note, I love your outfit! It's refreshingly simple and the colors are so nice. My favorite parts are your shoes and scarf, they add the perfect pop! You shoes are awesome!! And you are right....the summers are becoming more & more unbearable each day! nakakaloka talaga ang init, kung pwede lang talaga mawalan ng sweat glands!